Handcrafted Gift Ideas for your loved ones! Check out this article featuring Corina Contemporary Jewelry! Learn about our jewelry shop. Take a glance at our creations. Support the community and creativity. is a unique little shop which carries beautifully handcrafted jewelry and the delightful work of local artists. The owner and local silversmith, Corina Oberai, has been using her hands to create beautiful pieces for almost 40 years. Discovering her passion when she was just fourteen years old, she began selling the jewelry she made in her parents basement at craft shows throughout the area. While raising her daughters she sold her line to many Fine Craft Galleries across the country, such as the Frog Hollow Galleries in Vermont. In 2006 Corina returned to limited production and creating one-of-a-kind pieces and the Ballston Spa shop was opened. Over the last ten years this little shop has seen many renovations and has evolved into "The Land of Tea and Happiness" as it has been lovingly named by one of our young customers. has been evolving into the quaint, yet trendy place that it is today. Small boutiques, great restaurants, and eclectic antique shops line the streets while locals and visitors alike walk the village looking for unique finds, yummy food, and a nice chat. We are truly "The Village of Friends". Come in, Shop Local, Find Something Unique. Come in and see what we've been creating lately. We are always finding stunning new stones to create the next great piece! About 25 local craftspeople and artists are represented in the shop and new things are being created and displayed daily! Come in and Treat Yourself to Something Beautiful! 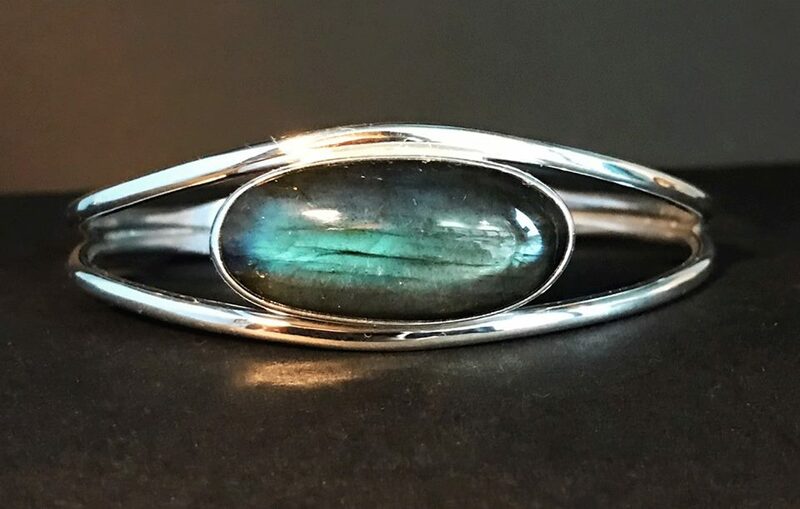 Join us for 15% off Labradorite Jewelry April 19th 3 - 8 pm and all day Saturday, April 20th! Labradorite captures everyone’s imagination with its flashes of iridescence and amazing depth of colors. Thought to purify your energy and connect you with the energy of light, labradorite is believed to bring you closer to discovering your dreams and uncovering your destiny. All jewelry featuring labradorite will be 15% off on Friday, April 19th 3 – 8 pm and all day Saturday, April 20th! Craving something sweet? Jessicakes Saratoga will create something yummy for you!! Corina invites everyone to come in and treat themselves to something beautiful!